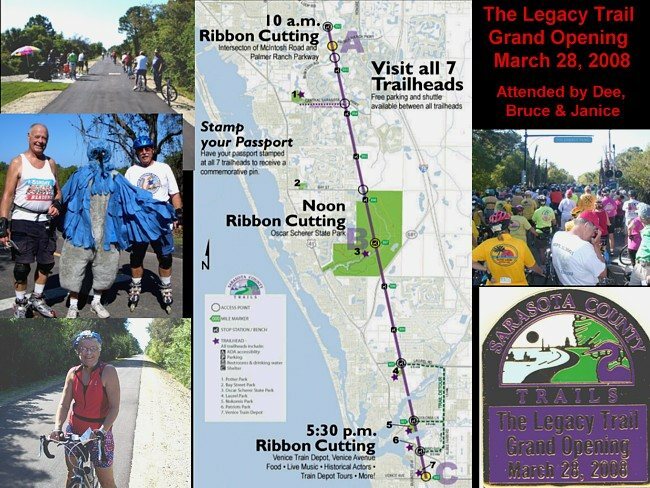 Janice, Dee and myself attended the Legacy Trail Grand Opening on 28 March. The Legacy Trail was missing about 3 necessary bridges. One bridge would be to get over Hwy 41 which was a huge expanse over a very wide section of highway. Two bridges are needed over waterways. Unfortunately the rumors indicate there is no money for the bridges in the near future. There are no trail heads with facilities on the trail. All locations with facilities and parking are parks within a mile or so of the trail but the side walks/access to the trail have not yet been made to be wide access trails. Where Dee and I started at the North ribbon cutting ceremony location was 60 miles from Dees house. However Dee made the trip in less than an hour. He said he didn't speed so I have to believe him. The Legacy Trail was velvet smooooooth. A lady came up behind us at the beginning and indicated we were doing great at 15 mph. Dee slowed down so he wouldn't have to carry/drag me back. They had water stops about every half mile on the Northern end. At the Southern end where the missing bridge detours were, you were basically on your own. The detours were horrible narrow sidewalks. We bladed about 28 miles but it took us 4.5 hours. I'm sure we averaged at least 10 -12 mph on the smooth sections so the detours had to be really slow. Janice tried to warn us about the detours but we were hard headed and had to do the whole works. Out of at least several hundred participants, there were only 4 rollerbladers including Dee and myself. People were amazed we were blading. We should give The Legacy Trail about a year for improvements between the bathroom/parking facilities to the trail. If the facilities to trail accesses get completed, we definitely need to have a blade there. If not on a Sunday, maybe another day.